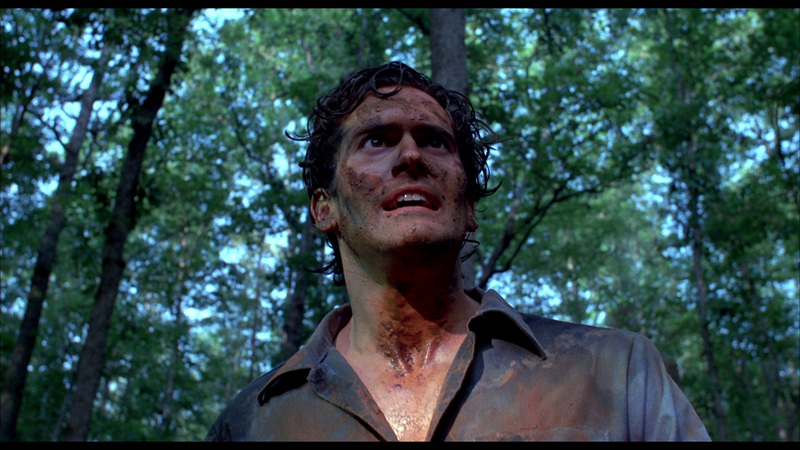 When Sam Raimi and Bruce Campbell made indie horror history with the relentless low budget The Evil Dead in 1980, you knew it was only a matter of time before a sequel was to be churned out and in this case the sequel turned out to be almost more of a remake (due to the fact that they couldn't use the footage from the first film to create a recap! ), than an actual follow up film - but who cares. 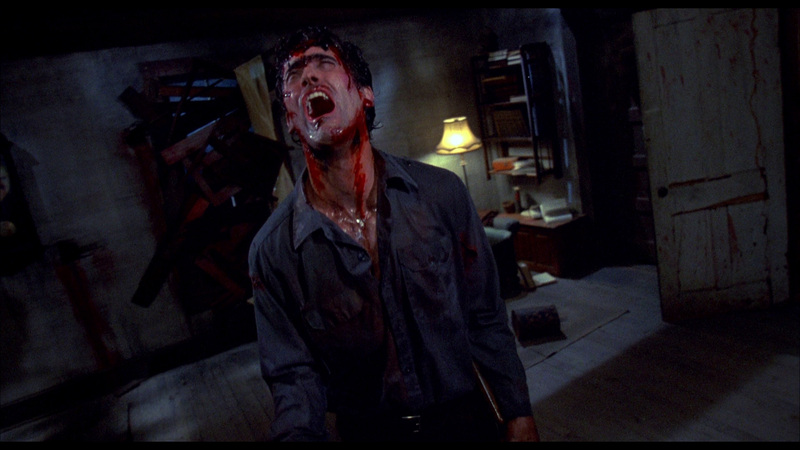 1987's Evil Dead II: Dead By Dawn is some of the most fun you're likely ever going to have with a horror film. 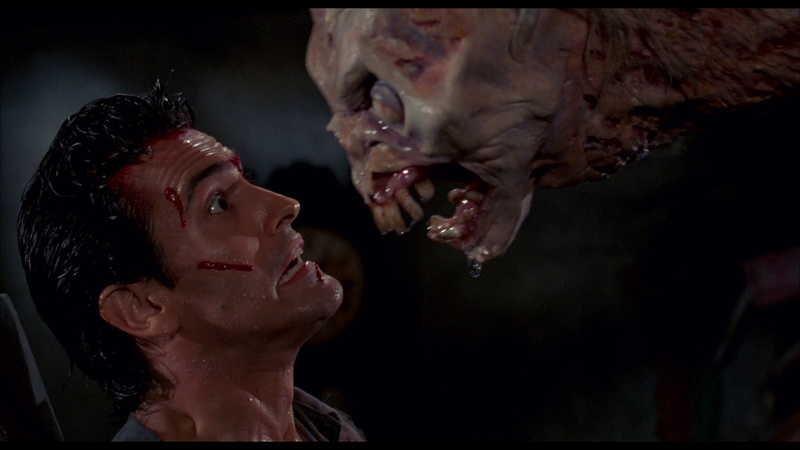 Before Sam Raimi helmed blockbusters like Spider-Man and before Bruce Campbell was a bestselling author and merchandising machine, they cut their teeth on some very infectious and flat out fun B-movie projects. Evil Dead II takes everything that was good about many of those early experiments, from the Three Stooges style physical comedy to the over the top acting to the fearless and relentless gore, and pumps it up until it explodes. Bruce Campbell's masterful physical comedy is the real star of the show, showing what a serious glutton for punishment Bruce really is. Ash gets beaten up to such an extreme and takes such a licking but still manages to keep on ticking that you can't help but love him, even if he is a bit of a moron. The scene where Campbell wrestles with his own hand is handled so well that it's really amazing that Bruce hasn't gone on to bigger comedic roles in the same way that Jim Carey or Will Farrell have. 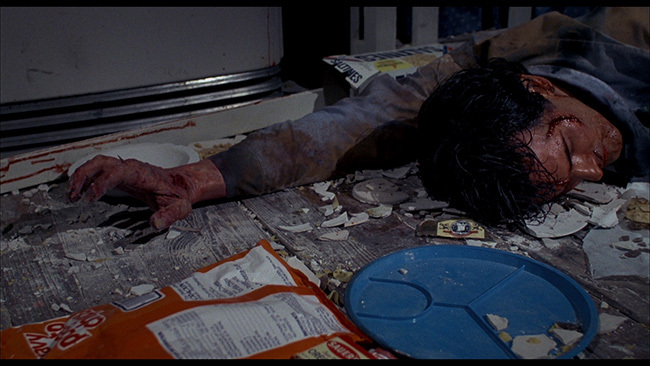 Just watch that scene where he has to flip himself in the kitchen (and then watch the extra features to see multiple takes of that scene) and you'll see just how insanely dedicated the man was to this role. At any rate, the film manages to do what so few horror films can pull off successfully and that's blend humor with horror. Most of the time when you mix laughs and scares you end up with something very mediocre, a film that can't really work as either a horror film or a comedy, let alone both but Evil Dead II is one of those rare breed of genre films that is able to make it happen. 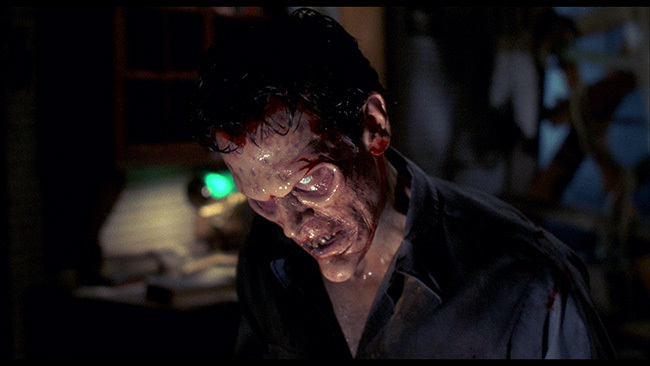 Raimi's completely off the wall direction and the movie's wild cinematography and use of different lenses perfectly captures not just Campbell's ludicrous performance and all that it entails but the increasing strangeness of the cabin as well. The supporting cast is there mainly to serve as fodder for Bruce's inspired lunacy, this is completely his show, though they're all quite fun in their respective roles. The possessed characters are eerie enough and weird enough on a visual level (Ted Raimi as Henrietta is a sight to behold!) to be more than a little unnerving and Raimi throws in a few good jump scares to ensure that we're never too far from the edge of our seats at any given time. Special effects wise, despite the fact that almost all of the arterial spray is any color but red, there's plenty of it on display in this film and the movie does not lack for gore. The latex appliances used by the 'Deadite' characters are grotesque and macabre serving as a flat-out weird contrast to Campbell's sheer, unadulterated goofiness. In this day and age of rampant CGI, it's nice to see the practical effects work on a movie like this hold up as well as it does. A few nice in-jokes for horror fans make this one a blast to revisit, with references to A Nightmare On Elm Street and Psycho both placed in the movie. 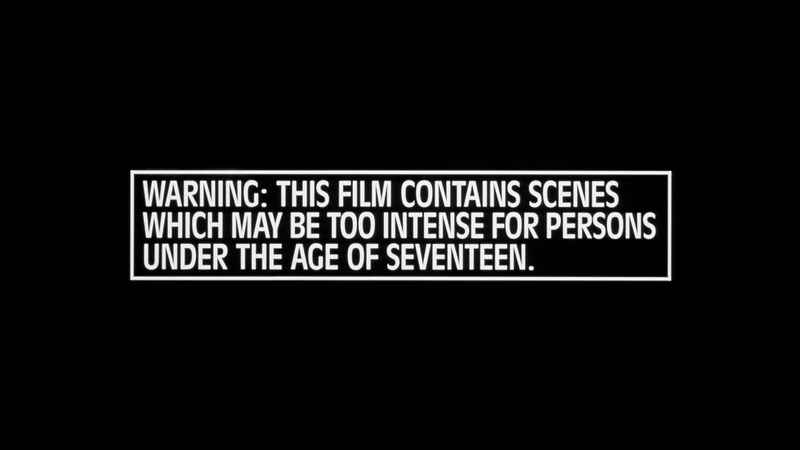 Note that for some reason the 'warning card' (which you can see below) that's been shown before the film in the past is not included on the UHD presentation for some reason. A minor grip, to be sure, but worth pointing out. 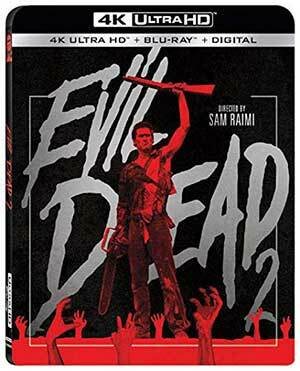 Evil Dead 2 makes its 4k debut on this UHD release from Lionsgate that comes complete with HDR and Dolby Vision. The 2160p HEVC / H.265 encoded image looks really nice and is framed at 1.85.1 widescreen. While there are a few spots where grain swarms a bit and looks a little clumpy, this is otherwise quite a nice upgrade. Detail is very strong throughout and while the enhanced resolution doesn’t do some of the optical effects any favors, you can’t really hold that against the presentation. Colors look fantastic here, they pop without looking artificially boosted, and are frequently very impressive. 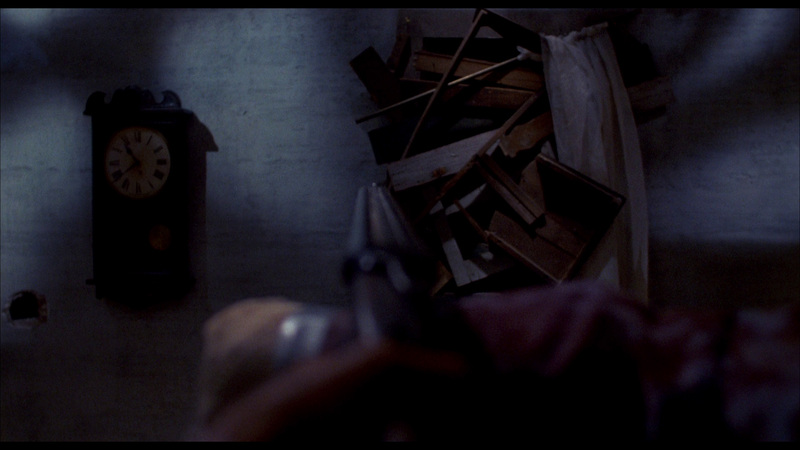 There’s strong texture here as well, improved depth too when compared to the Blu-ray release. Skin tones look spot on and while, yeah, the image is grainy there isn’t much in the way of actual noticeable print damage to complain about at all. Fans should be quite pleased with the 4k facelift that’s been given to Evil Dead 2, it looks damn fine on this disc. The English language DTS-HD 5.1 Master Audio track on this disc is a good one, though it appears to be identical to the one included on the 25th Anniversary Blu-ray release from 2011. 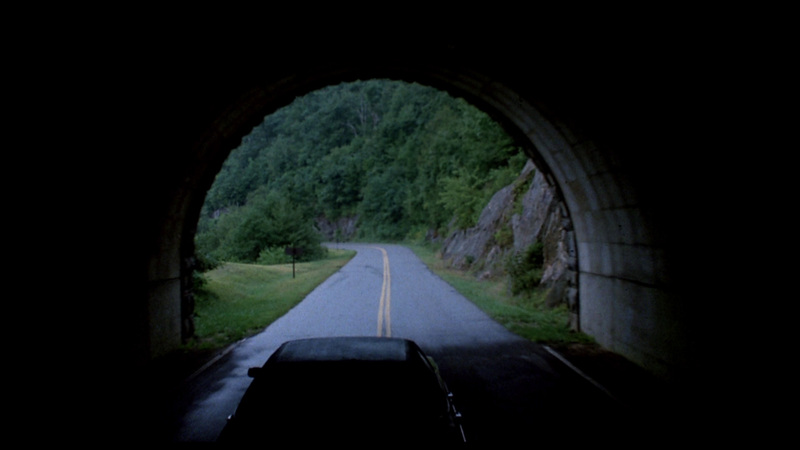 There's good use of the surrounds throughout the movie, with some great rear channel activity making the scenes where the 'evil' zips around through the woods really come to life, as do the scenes where things start to get really crazy for Ash inside the cabin. Dialogue stays clean and clear and the score sounds nice and strong. Effects are powerful enough that you'll definitely take notice, but they don't overpower the performers. It would have been nice to get the original 2.0 track here, but that didn't happen. There are no alternate language options included but subtitles are provided in English, English SDH and Spanish. Note that the screen caps below are from the included Blu-ray disc, not the 4k UHD disc. The transfer on the Blu-ray is the same as what was seen on the 2011 25th Anniversary Blu-ray release (in fact, it is for all intents and purposes the same disc entirely). Carried over from past editions is the feature length commentary track with Bruce Campbell, Sam Raimi, Greg Nicotero, and Scott Spiegel that was originally recorded for the Laserdisc release years back. For those of you who haven't heard this track, it is one of the funniest and most enjoyable commentary tracks I've ever had the pleasure of listening to. The four participants all get along really well and are obviously have a good time remembering the making of the movie together. Bruce tends to talk over the rest of the guys more often than not and there are a lot of playful pot shots aimed at one another but their enthusiasm for their work is quite infectious and this track manages to be both interesting and quite amusing. This is included on both the 4k UHD disc and the Blu-ray disc. Included on the UHD is a new featurette called Bloody And Groovy, Baby. It’s a fifty-three-minute long piece made in 2018 that includes thoughts on the film from Edgar Wright, Guillermo del Toro, and Roger Corman among others. 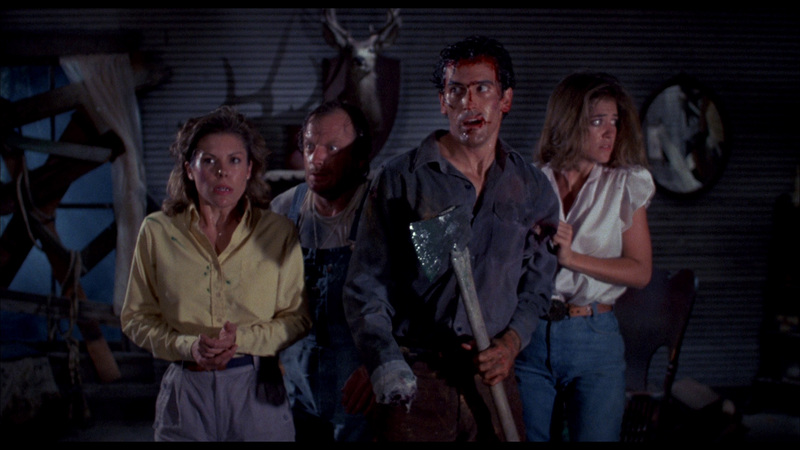 It’s essentially a tribute piece with all the participants waxing nostalgic about the cultural significance and importance of the Evil Dead films. This was made for Studio Canal’s French release and large chunks of it are in French, though English subtitles are provided. It really doesn’t tell us anything that we don’t already know – the extras on past releases have been very thorough and very comprehensive – but it is, if nothing else, a nice collection of thoughts on the films in the series from people who clearly hold them in very high regard. 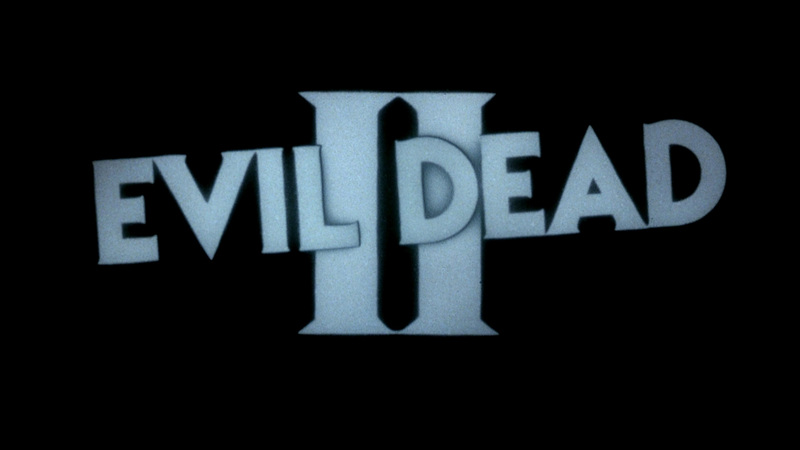 The Blu-ray disc, aside from the aforementioned commentary track, also holds the excellent feature length ninety-one-minute documentary, Swallowed Souls: The Making of Evil Dead II from Red Shirt Pictures. Broken up into seven parts - Dead by Dawn, The Chosen One, Madman Sam, Dead Effects, Re-Animated, Method to Madness and Rosebud - this is an insanely detailed and consistently interesting look at the making of the film. Interviewed here are Bruce Campbell, Sarah Berry, Danny Hicks, Ted Raimi, Kassie Wesley, Mark Shostrom, Greg Nicotero, Howard Berger, Robert Kurtzman, Doug Beswick, Tom Sullivan and Rick Catizone and topics covered here cover everything from how and why a sequel was made in the first place to location scouting to shooting in North Carolina (including a scary story about segregated Laundromats!) 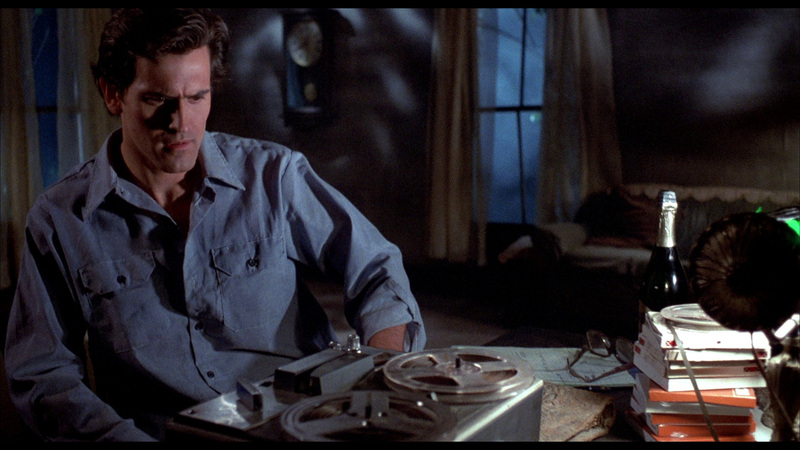 to the more expected stories of putting together the effects work, torturing Bruce Campbell, Raimi's directing style and more. All involved look back on the shoot pretty fondly despite the fact that it was obviously a lot of work and sometimes done under less than ideal conditions. It would have been nice to see Sam Raimi here but it's not surprising that it didn't happen - his omission is really the only strike against this otherwise interesting, informative and very well put together documentary that mixes in some great on set footage with archival stills and pertinent clips alongside the newly shot interviews that make up the bulk of the running time. Also carried over on the Blu-ray disc are two additional featurettes, the first of which is The Road to Wadesboro: Revisiting the Shooting Location of Evil Dead II which, as the title implies, takes us back to where the movie was shot for roughly eight minutes. The school gymnasium where most of the interiors were shot is now more or less abandoned and looking like it'll be torn down soon, while the cabin out in the woods still stands, but just barely. 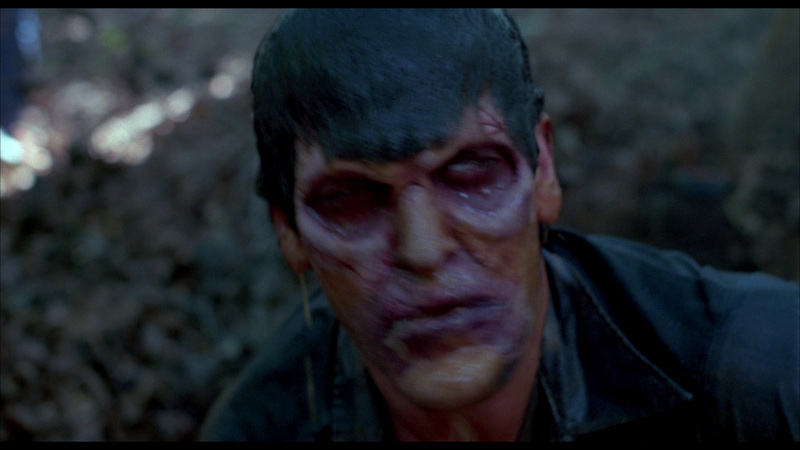 The second new featurette is Cabin Fever which is a pretty awesome collection of roughly half an hour's worth of material shot on the set of the film during production by FX man Greg Nicotero. These are fun to watch as they not only give you a look at what it was like on set but they also let us see how the cast and crew got along together and the sense of camaraderie that existed, particularly amongst the effects guys. 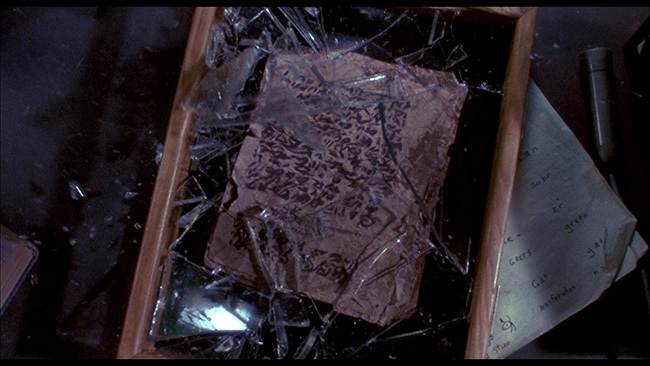 The Blu-ray also contains The Gore, The Merrier, which is a great look behind the scenes at the making of the film that runs thirty-two-minutes and will be familiar to anyone who has owned this in the past. 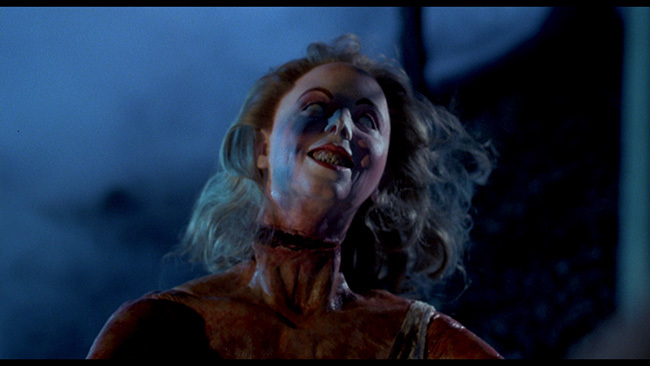 Also look for the seventeen-minute segment entitled Behind The Screams which is narrated by Tom Sullivan. This gives us a look at a bunch of the special effects work that was done on the film through a bunch of still photographs and it proves to be pretty interesting stuff. Less substantial but still pretty neat to see are a new Artifacts Of The Dead still gallery, a huge still gallery archive of marketing materials, production photos, special effects, and animation work, the film's original theatrical trailer, a couple of TV spots, animated menus and chapter stops. Both discs fit inside a black Blu-ray-sized case that in turn fits inside a slipcover. Also included inside the case is an insert with a download code that can be redeemed for a digital HD version of the movie. 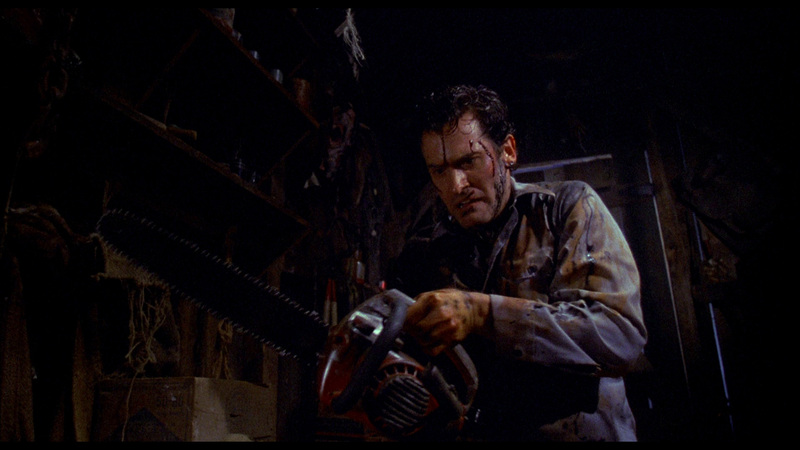 Evil Dead II has lost none of its charm over the years and it remains one of the most enjoyable horror films of the eighties. Campbell has rarely been better than he is here and the film captures Sam Raimi at the height of his zany creative peak. Lionsgate's 4k release of the film looks and sounds very good indeed, and it carries over a lot of the existing extras from previous releases (though not all) and throws a few new ones into the mix as well. Highly recommended! Click on the images below for full sized Evil Dead 2 Blu-ray screen caps! Ian, that first cap of the "warning" title card from the included blu-ray actually isn't on the UHD disc, just FYI. It goes from the Studio Canal logo straight to the Rosebud logo. Not sure why it got lopped off, but it's a shame. Yeah I noticed that. I'll update the review to mention it.